HONG KONG, CHINA--(Marketwired - Nov 2, 2016) - Artesyn Embedded Technologies announced Safety Integrity Level 4 (SIL4) certification for the Artesyn Embedded Computing, Inc. ControlSafe™ Expansion Box Platform with ControlSafe™ Expansion Box computer and ControlSafe™ EXB software. Certified by TÜV SÜD, one of the most trusted certification bodies worldwide, this commercial off-the-shelf (COTS) fail-safe and fault-tolerant computing platform is designed for a wide range of train control and rail signaling applications, especially large scale applications requiring substantial I/O processing capability. The ControlSafe Expansion Box Platform can either be configured as a dual-redundant safety system or deployed as an I/O expansion subsystem. "Our second SIL certified computing platform for rail applications and an enthusiastic response to the ControlSafe portfolio at the recent Innotrans exhibition underlines the fact that Artesyn is the go-to company for SIL4 COTS solutions," said Linsey Miller, marketing vice president, Artesyn Embedded Technologies. "At the show, we had interest from integrators and developers of all kinds of rail systems and applications such as ETCS, CBTC, PTC, ATP, ATO, interlocking and radio block center. We also had enquiries from companies outside rail with safety applications in industries such as mining and process automation that are looking to take advantage of COTS technology with the reassurance of SIL4 certification." Artesyn's ControlSafe Platform enables rail application developers and system integrators to substantially accelerate time-to-market without being deterred by the potentially high costs and risks associated with the stringent SIL4 system development and certification process, a process that can take multiple years to accomplish. Designed to deliver best-in-class platform hardware availability of six nines (99.9999%)1, Artesyn's ControlSafe Expansion Box Platform is fully certified to EN 50126 for reliability, availability, maintainability and safety (RAMS) processes; EN 50128 for safety-related software; and EN50129 for safety-related electronic systems. It implements an innovative data lock-step architecture and hardware-based voting mechanism that supports high performance modern processors, and is modular, scalable and designed to seamlessly accommodate additional I/O interfaces as well as upgraded processors that will be required throughout the product life cycle. In addition, the ControlSafe Expansion Box Platform allows application developers to migrate existing application software with minimal modifications. By leveraging the same technologies and safety architecture as Artesyn's original ControlSafe Platform, but with more capacity, the new ControlSafe Expansion Box Platform will significantly enhance the growing Artesyn ControlSafe product portfolio. The shared safety architecture makes it easy to transfer applications between the two and deploy a common platform for a wide range of rail signaling and train control applications. 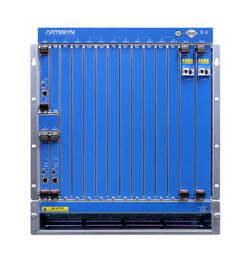 Targeting mainly wayside applications, the Artesyn ControlSafe Expansion Box Platform is designed to support a broad range of I/O modules such as CAN, Ethernet, Ethernet Ring, UART, digital and analog to enable solution integrators to handle both new deployments and upgrade projects easily. Artesyn can also develop specific I/O solutions to meet unique application requirements with its industrial and transportation design services.